ABSTRACT: A process akin to Schoenberg’s “musical idea” accounts to a large degree for motivic coherence in the first movement of Beethoven’s Piano Sonata Op. 10, No. 1. My article illustrates this process by means of a synthesis of Schenker’s and Schoenberg’s approaches to analysis. I use Schenkerian analysis to identify potential motives at various levels of musical structure, then interpret the treatment of some of these segments according to Schoenberg’s model. I also show how the primary motivic process interacts with other such processes in the first movement. Among followers of Schenker, the notion of “hidden repetition” has garnered a good deal of interest in recent years. Articles by Beach, Burkhart, Cadwallader and Pastille, Kamien, Rothgeb, and Schachter, among others, have illustrated how repetition of a given motive or motives at different levels contributes to organic coherence in a variety of tonal works. (1) However, one rarely finds in this literature a comprehensive treatment of how the repetitions of a motive (hidden or otherwise) in a piece bind together into one all-encompassing process. Many tonal pieces can be heard as working out just such processes: one not only exists in the first movement of Beethoven’s Sonata Op. 10, No. 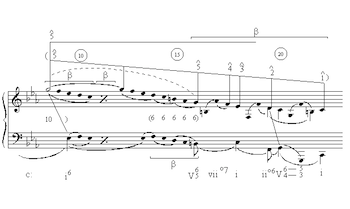 1, but also accounts to a large degree for that piece’s motivic coherence. I believe “Schenkerian-Schoenbergian Analysis” introduces a new way of amalgamating the two approaches. Others have attempted to combine them, most notably David Epstein in Beyond Orpheus, but in ways considerably different from the present article. (5) Epstein’s concept of “musical idea” focuses primarily on the power of the Grundgestalt to unify the piece through its repetition at various structural levels, not on the dialectical process that organizes such repetitions through the piece. (6) His focus results in some insightful analyses, which sometimes describe the introduction of elements foreign to the main tonality within the Grundgestalt and the elaborations through the piece of such oppositions (his account of the E -D-C motive that appears in measures 4–5 of the first movement of Beethoven’s Eroica Symphony and its subsequent consequences is a good example; see pages 111–27). Yet rarely does he show how such foreign elements are assimilated into the home tonality as the final stage of an overarching process. In addition, the middleground shapes Epstein claims as offspring of the motive sometimes diverge from what would typically be considered Schenkerian middlegrounds (again, an example can be found in his Eroica analysis: a reordering of the E -D-C motive that goes D-E -D , see page 114). In the present article, middleground motives always function as diminutions in an orthodox sense. Another, more recent, contribution that combines aspects of Schoenberg’s theoretical writings with the Schenkerian approach is Janet Schmalfeldt’s Music Analysis article on the “Reconciliation of Schenkerian Concepts with Traditional and Recent Theories of Form.”(7) Schmalfeldt focuses on a different aspect of Schoenberg’s theoretical output from my article: she demonstrates rather convincingly the mutual influences between formal elements introduced or developed by Schoenberg in Fundamentals of Musical Composition and various harmonic-contrapuntal structures characteristic of the Schenkerian viewpoint. Much of her article deals with Schenkerian correlates to the parts of the “sentence” structure proposed by Schoenberg in Fundamentals, but in addition she illustrates how Schoenberg’s distinction between “fixed” themes and “loosely-constructed” themes and transition sections is enriched by and contributes to the Schenkerian perspective. One of the main pieces she analyzes is the same Beethoven sonata movement I take up in my article; accordingly, I will comment on differences between Schmalfeldt’s and my analyses of specific passages in the footnotes. According to Schoenberg’s “idea,” the next step in Beethoven’s process, having established an opposition between motives delta and alpha, would be to elaborate that opposition. Analyses by Schoenberg, Patricia Carpenter, and Severine Neff (as well as others) illustrate a variety of ways that tonal pieces elaborate such oppositions; often, one of the opposing elements is a foreign pitch or chord with respect to the home key and the other is the tonic triad, and the elaboration consists of allowing the foreign element to simulate a tonic. In the movement under consideration, however, the procedure is a bit different, since the opposing elements are two motives, both members of the tonal-prolongational structure of measures 1–9, which are marked as divergent by surface characteristics such as register and dynamics rather than by the tonalities they represent. In a few words, Beethoven gradually increases motive alpha’s salience by giving it delta’s original surface characteristics, while at the same time submerging motive delta by replacing its dominant characteristics with more recessive ones. This process then culminates in delta becoming a diminution of alpha, which, it seems to me, makes the motivic process resemble Hegelian dialectic. The exchange of status between the two motives begins at the exposition’s second theme, directly following a transition based almost entirely on the inversion of motive delta. See Example 2. (10) The first presentations of alpha in measures 56–70 are somewhat veiled: they occur in the middleground behind the bass part, and are inversions of the original alpha. The soprano during these same measures does not present alpha as such; but instead begins with the middleground succession 1ˆ-7ˆ 4ˆ-3ˆ. This succession not only balances upper and lower neighbors like alpha and hence can be heard as related to it, but it also creates a rather normative example of the style structure Robert Gjerdingen identifies as a hallmark of the Classical era; combined as it is with alpha in the bass and I - V - V - I in the harmony, and placing as it does suspensions leading to 7ˆ and 3ˆ on downbeats 4 measures apart. (11) The soprano follows this at measures 64–71 with an ornamented version of a similar succession, 1ˆ-7ˆ 2ˆ-3ˆ, which in its contrapuntal, harmonic and metrical contexts also strongly resembles Gjerdingen’s style structure. The passage we have just discussed and the corresponding one in the recapitulation (measures 215–48) are the only places in the movement where alpha plays a part in such structures; so that it is not necessary here to shift our focus to them from the process we are beginning to describe involving the gradual transformation of alpha within this movement. (Had we been considering relationships between Beethoven’s sonata movement and those of his Classical precursors—as Gjerdingen does—we might, however.) We can think of such style structures as early stages that alpha passes through on its journey toward greater salience: stable passages within which alpha (as bass line rather than inner voice) plays an increasingly significant role. The codetta in the exposition summarizes the direction of the foregoing measures and at the same time brings alpha forward all the way to the surface of the music. See Example 4. The tonic pitches in the descending E arpeggio from measure 98 to measure 105 are all decorated by lower and upper neighbors; the former harmonized, the latter dissonant. The dominant pitches receive a single upper neighbor. The development section begins with a presentation of motive delta, the ascending third, in C major, which retains many of the surface features that accompanied delta in the first theme: the ascending arpeggios leading up to E and F, the alternation between forte and piano dynamics, the accents on repeated E s and Fs. See Example 5. But two essential features of the original ascending third are now missing; and because of this, it makes more sense to hear high E , F and G as surface diminutions rather than the low-middleground motive that delta had originally been. First, motive delta no longer prolongs a tonic triad—while the E is harmonized by I and the F by viio , just as before, the G is now supported by a viio of iv, leading into the next section of the development which tonicizes F minor. Second, the harmonization in parallel tenths that delta had originally had has disappeared: instead, we hear E -F-G in the lowest voice, which would cause middleground parallel octaves with a manifestation of delta in the highest register. Possibly we could hear this low-register ascending third as delta without the accompanying tenths, but in that case the members of delta would all lack the surface characteristics such as diminution, accent, and dynamics that marked them as dominant in measures 1–9. All these factors work together to make the ascending third less salient. Meanwhile, motive alpha also bridges I to viio of IV, but as a diminution circling around a single note—E this time rather than C—it seems better able to retain its aural identity while reinforcing the ultimate direction of the passage (toward the subdominant). The trend of bringing motive alpha forward to the surface and thus increasing its salience, which we heard in the exposition, continues in the development. See Example 6. At measures 119–21, we hear the double neighbor at the surface in the soprano: this is the original form, with lower neighbor first. It appears again a perfect fourth higher at measures 127–29, as part of a sequence tonicizing first iv, then iv of iv. At the same time, the inversion of alpha underlies the tonicizations of F minor and B minor, in a manner very similar to the second theme. All the notes of alpha get a consonant skip of a third, as they had in the earlier passage, and the harmony, I - V - V - V7 - I, only slightly varies that of the earlier passage (though the addition of V7 turns alpha into a motive projected by a combination of two voices; the third note of alpha—E in measure 121 and A in measure 129—is, according to my reading, a tenor note). In measures 118–33, then, the alpha motive appears simultaneously at two levels—foreground and low middleground—saturating the pitch structure in a way we have not heard to this point. In the measures almost immediately following, the double neighbor begins to saturate the piece in another way. See Example 7, my graph of measures 136–41 and their immediate context. Here, every two-measure unit contains alpha, presented in sixths and tenths without accompaniment to call the listener’s attention to it. These measures are a culmination of the double neighbor’s gradual growth in salience—at this point in the movement, nothing is happening except alpha. The graph makes clear the function of these motivic repetitions in their larger context: they embellish a prolonged neighbor A which resolves back to the primary tone at measure 148. One interesting aside about Beethoven’s approach to the primary tone: note that the B neighbor that supplants A in measures 143–45, the A , and the eventual resolution G are counterpointed by lower neighbors in the bass, E -F and B -C. The notion of balancing upper and lower neighbors affects this piece in ways beyond the process involving the alpha motive. We’ll see another, higher-level, example later on. As one would expect, the recapitulation replays the motivic process we heard in the exposition, with few changes (although one of those changes is extremely significant to the motivic process as a whole). Motive delta reasserts itself at measures 168–76, “pushing alpha back down into the inner voice,” as it were. And although the recap’s transition points toward F major rather than E as it originally had, it still relies heavily on inversions of delta. Motive alpha does not begin to regain the upper hand until the second theme at measure 215. See my graph of measures 215–47 in Example 8. Since Beethoven states the first two phrases of his theme in F major, then repeats them in C minor, we have two opportunities to hear the repeated inversion of alpha in the bass, counterpointed against 1ˆ-7ˆ 4ˆ-3ˆ and 1ˆ-7ˆ 2ˆ-3ˆ in the soprano. Not only has the composer “corrected” the key of his second theme, but he has given himself an opportunity to powerfully reassert the alpha motive through repetition. 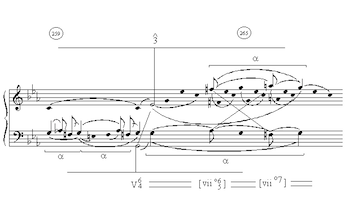 In measures 251–53, the movement’s fundamental line makes its descent to 3ˆ, and this is followed almost immediately (at measures 259–67) by the statements of motive alpha that we heard first in the latter measures of the exposition’s second theme. See Example 9. In the recap, the double neighbors ornament the fifth scale degree, G, setting the listener up for the movement’s final cadence. The first two of these at measures 259 and 261 are not that different from their counterparts in measures 82 and 84. (One might comment on the way the upper neighbor is delayed in the second alpha through consonant skip diminutions.) But the third and fourth manifestations of motive alpha at measures 263–67 add something significant to their counterparts at measures 86–90: the double neighbor that mirrors that of the bass has been moved up from the alto into the soprano. As the alto had earlier, the soprano here projects a transposition of the original alpha motive (that is, with lower neighbor first). Like its alto predecessor, this soprano occurrence of alpha includes an ascending third as a diminution between the lower and upper neighbors, and the ascending third, like the original delta of measures 1–9, is ornamented by arpeggios. This subsumption of delta and its diminutions by alpha, as I suggested before, constitutes the motivic synthesis that completes the movement’s overarching dialectic. While this synthesis had been buried in an inner voice at measures 86–90 (like the alpha motive itself at measures 1–9), here it bursts into prominence, capturing both of the outer voices that had belonged to delta at the beginning of the movement. In the opening movement of the Op. 10, No. 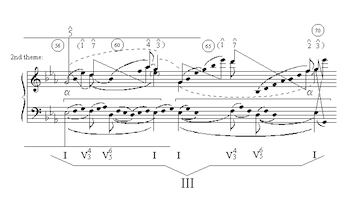 1 sonata, however, it is difficult to find unusual characteristics of (for instance) the alpha motive in measures 1–9 that it shares with the other manifestations of alpha in the piece. Indeed, alpha’s gradually taking on new characteristics as the movement progresses is a crucial reason for my hearing the piece as the elaboration of an opposition between alpha and delta. It seems that here the motives should be justified as such on different grounds. Possibly the fact that they take part in a process that spans the entire piece is enough; in other words, it is the motivic progression itself that invests alpha and delta with motivic significance. My viewpoint here does not go too far beyond Schoenberg’s when he asserts in Fundamentals of Musical Composition that “every element or feature of a motive must be considered to be a motive if it is treated as such, that is if it is repeated with or without variation.”(14) The main difference is I am claiming that it is not mere directionless repetition or variation, but an organized process of repetition and variation that causes me to single alpha and delta out from among all the other components of voice-leading in the piece. Many tonal pieces do indeed repeat and vary double neighbors and third-spans harmonized in tenths, but how many set two such components against one another in an opposition based on surface characteristics at the beginning, allow one to gradually wrest the position of dominance (or salience) from the other as the piece progresses, then culminate the process at the end by making the component that had been more salient at the beginning serve as the diminution of the other? One other voice-leading component that Beethoven identifies as a motive through the process in which it plays a part is what I will call motive beta. Motive beta gives rise to a non-dialectical process that also helps to structure the work, and in addition beta combines with delta and alpha in ways significant to the shaping of the piece. Motive beta is the stepwise descent through a perfect or diminished fifth. Its most common version, G-F-E -D-C, makes its initial appearance at the end of the Grundgestalt (measures 9–10) at the surface. See Example 10. Motive beta is repeated immediately at the surface, then repeats with identical pitch classes at the middleground in measures 16–22. An incomplete beta, G-F-E -D, also provides a middleground framework for the closing measures of the development, measures 148–58. Finally, motive beta at the same pitch classes, G-F-E -D-C, provides the Urlinie for the entire movement. As we progress through the movement, then, we realize that beta is undergoing a progressive expansion—it contributes to the pitch structure on progressively higher levels. At the same time, all this expansion is balanced by beta’s occurrence (again as G-F-E -D-C) on the surface at the end of the piece. My Example 11 illustrates this. These surface reminders of beta at piece’s end hook up with motive alpha in an interesting way—notice that the C that ends beta at measure 273 reappears as the goal note of alpha two measures later. In this way, beta seems to lead into alpha. But at the beginning of the piece, delta had led into beta in a similar way—see Example 1 again—the last note of delta becomes the first note of beta. We could characterize the interaction between the three motives at beginning and end of piece as delta “handing off” to beta, which in turn “hands off” to alpha. Here also, we have a motivic process that shows alpha supplanting delta. Another aspect of the piece’s motivic structure that my account of the dialectic involving delta and alpha ignored is the occurrences of these two motives at levels higher than the low middleground. There are a number of them, but we will focus on only one, portrayed in Example 12. This example verticalizes the unfoldings from the second theme in the exposition and changes some registers to clearly illustrate the underlying voice-leading. As it turns out, the unfoldings in measures 56–70 project an upper neighbor G-A -G followed by a lower neighbor G-F-G—a close relative of the inverted alpha motive on E that structures the bass line in that same passage. We have seen that a segmentation of Beethoven’s Op. 10, No. 1 according to Schenkerian principles reveals a succession of motives that closely resembles the compositional dialectic of Schoenberg’s “musical idea.” I believe that this approach constitutes a new way of combining Schenkerian and Schoenbergian analysis, one that could have value for the analysis of works other than Beethoven’s. Recently I have tried a similar “hybrid” approach for the analysis of the first movement of Mahler’s Tenth Symphony and for some of Schoenberg’s Op. 6 songs. With both composers, “Schenkerian-Schoenbergian Analysis” led to some significant insights about how the music makes sense as a process in time. What is most interesting is that Schoenberg’s “idea” is able to form a framework for pitch structures in Beethoven and Mahler as well as Schoenberg’s own music—possibly this musikalische Gedanke could be one among several keys to understanding the development of music in German-speaking countries in the nineteenth and early twentieth centuries. 1. David Beach, “Motive and Structure in Beethoven’s Piano Sonata Op. 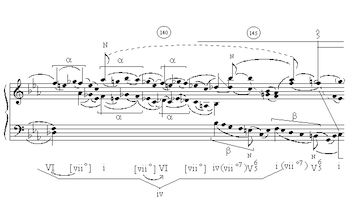 110, Part I: The First Movement,” Integral 1 (1987): 1–29; Charles Burkhart, “Schenker’s Motivic Parallelisms,” Journal of Music Theory 22 (1978): 145–75; Allen Cadwallader and William Pastille, “Schenker’s High-Level Motives,” Journal of Music Theory 36 (1992): 119–48; Roger Kamien, “Aspects of Motivic Elaboration in the Opening Movement of Haydn’s Piano Sonata in C Minor,” in Aspects of Schenkerian Theory, ed. David Beach (New Haven and London: Yale University Press, 1983), pages 77–93; John Rothgeb, “Thematic Content: A Schenkerian View,” in Aspects of Schenkerian Theory, ed. David Beach (New Haven and London: Yale University Press, 1983), pages 39–60; Carl Schachter, “Motive and Text in Four Schubert Songs,” in Aspects of Schenkerian Theory, ed. David Beach (New Haven and London: Yale University Press, 1983), pages 61–76. 2. For instance, David Epstein’s Beyond Orpheus: Studies in Musical Structure (Cambridge, MA: MIT Press, 1979), in general treats the Grundgestalt as a unifying interval pattern, while Patricia Carpenter and Severine Neff (and I) understand it as the source of a “tonal problem” that gives rise to a process of elaboration and resolution. See the Carpenter and Neff articles cited in footnote 3. 3. Schoenberg mentions musical idea and its components briefly in essays such as “New Music, Outmoded Music, Style and Idea,” Style and Idea, trans. Leo Black, ed. Leonard Stein (Berkeley: University of California Press, 1984), pages 113–24, and in Fundamentals of Musical Composition, 2nd ed., ed. Gerald Strang and Leonard Stein (London: Faber and Faber, 1970). He treats the concept more substantively in his posthumously-published textbook The Musical Idea and the Logic, Technique and Art of its Presentation, ed., trans., and with a commentary by Patricia Carpenter and Severine Neff (New York: Columbia University Press, 1995), though even there he does not present a complete illustration of a musical idea manifested by an individual work. 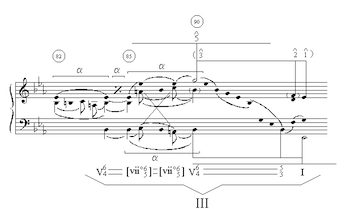 More exhaustive applications of Schoenberg’s approach are provided by his student Patricia Carpenter and Carpenter’s student Severine Neff in a series of articles, of which the following are representative: Carpenter, “Grundgestalt as Tonal Function,” Music Theory Spectrum 5 (1983): 15–38; idem, “A Problem in Organic Form: Schoenberg’s Tonal Body,” Theory and Practice 13 (1988): 31–63; Neff, “Schoenberg and Goethe: Organicism and Analysis,” in Music Theory and the Exploration of the Past, ed. David Bernstein and Christopher Hatch (Chicago: University of Chicago Press, 1993), pages 409–33. 4. John Rothgeb, review of Brahms and the Principle of Developing Variation by Walter Frisch, Music Theory Spectrum 9 (1987): 204–15; idem, “Thematic Content,” 40–42; Charles Burkhart, “Schenker’s Motivic Parallelisms,” 146–47. 5. See footnote 2 for a full reference to Epstein’s work. 6. Such an interpretation of Schoenberg’s concept can be traced back to Josef Rufer’s analysis of the first movement of Beethoven’s Sonata Op. 10 No. 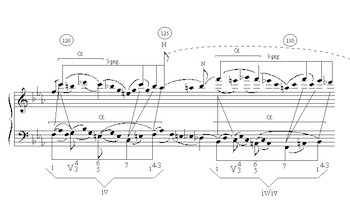 1 in Composition with Twelve Notes Related Only to One Another, trans. Humphrey Searle (New York: Macmillan, 1954), pages 38–45. Rufer highlights the repetitions and variations of motives in the movement’s initial phrase, showing how such techniques unify the movement (and mark Beethoven as a precursor to Schoenberg the twelve-tone composer), but gives no suggestion that a process involving problem, elaboration and resolution organizes the motivic variation. 7. Janet Schmalfeldt, “Towards a Reconciliation of Schenkerian Concepts with Traditional and Recent Theories of Form,” Music Analysis 10/3 (1991): 233–87. 8. Example 1 also illustrates the initial occurrence of a third motive, beta, the descending fifth. Its later manifestations in the movement will be discussed at length in paragraph . 9. My reading of measures 1–9 is modeled (though not at every point) on Schenker’s analysis in “Further Consideration of the Urlinie: I,” trans. John Rothgeb, in The Masterwork in Music, vol. 1, ed. William Drabkin (Cambridge: Cambridge University Press, 1994), pages 105–06. Schenker’s graphs at levels d) and c) in this analysis not only clearly portray what I am calling motive delta as an ascending third harmonized in tenths and my alpha as a neighbor C5-B4-C5 that is then turned into a double neighbor through the addition of the diminution D5, but they also give alpha a smaller notehead size, marking it as an inner voice in this initial presentation. Schenker in the commentary writes about a “dispute” between alpha and delta, characterizing them as ‘competitors’ for status as principal line and asserting that delta deserves preeminence as initial ascent to the primary tone. The characterization of the two motives in this Grundgestalt as opponents actually did not originate with Schenker. He may have been aware that Anton Schindler, Beethoven’s contemporary and associate, described this same passage as a manifestation of the concept of Zwei Principe, which in Beethoven’s thinking (according to Schindler) involved the opposition of ‘strong’ and ‘gentle’ musical characters. See Nancy Hager, “The First Movements of Mozart’s Sonata, K. 457 and Beethoven’s Opus 10, No. 1: a C Minor Connection?,” The Music Review 47/2 (1986–87): 95–96. Janet Schmalfeldt in the above-mentioned Music Analysis article (page 256, first half of Example 8) also presents a graph of measures 1–9, which differs only in one essential aspect from my reading: she does not interpret the D5 in measure 8 as part of a double neighbor figure, but as a chord tone harmonizing the middle member of the lower neighbor C-B-C. My reasons for highlighting the D5 as part of motive alpha will become obvious; but her reading has the advantage of more faithfully following Schenker. 10. 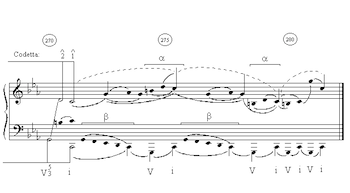 The transition is not shown in Example 2 to save space in the graphical file; the reader will want to refer to the full score for measures 32–56. Descending groups of three parallel 10ths can be heard at measures 34–36 and measures 38–40; while measures 42–46 adds tenths before and after to extend the motive to five parallel tenths, and the dominant pedal following measure 48 repeats the descending form of delta twice at measures 49–52 and 53–56, in soprano and tenor voices. 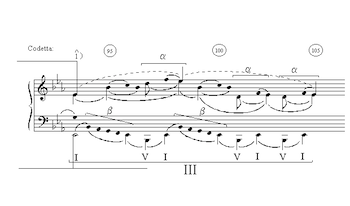 Schmalfeldt also provides a graph of the second theme in her Ex. 14 (pages 272–73). The reader can compare her analysis with both of my Examples 2 and 3 (Ex. 3 will be discussed in the following paragraph). Again, the general perspective—second theme as a prolongation of 5ˆ over III, a focus on neighbor motion in measures 56–71 and a middleground descent in measures 90–94—seems to be the same. But we differ on some of the details, especially our readings of measures 82–86. Schmalfeldt hears this passage as a prolongation of 6ˆ over IV (the A is introduced back in measure 80), enabling her to characterize it as part of a culminating development of the G-A -G motive that has been prominent throughout the second theme (seeher commentary on pages 275–76). My reading takes the “more conventional” tack of hearing 82–86 as prolongation of the cadential six-four chord, which enables me to set Bb as a consonant starting and ending point for repeated statements of motive alpha. 11. Robert O. Gjerdingen, A Classic Turn of Phrase (Philadelphia: University of Pennsylvania Press, 1988), especially chapters 4 and 5. 12. My interpretation of measures 86–90 as two alpha motives hinges on reading the six-four chord in measure 88 as a passing chord within a prolongation of the same chord from measure 86 to measure 90. This sort of interpretation has precedents in the Schenkerian literature—for example, Schenker’s own reading of measures 21–28 of J. S. Bach’s C-Minor Prelude from Book I of the Well-Tempered Clavier. Schenker maintains that a cadential six-four chord in measures 21–27 resolves to V at measure 28. The prolongation of the six-four chord is accomplished mainly through a neighbor viio7/V. In turn, chromatically-altered chord skips from F to A and back to F within this viio7/V are filled in by passing Gs, creating passing six-four chords that are ultimately part of the prolongation of the same chord. 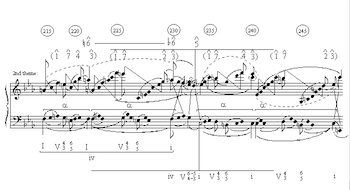 See Figure 1 (page 48) and the associated commentary (especially pages 50–51) in Heinrich Schenker, “The Organic Nature of Fugue as Demonstrated in the C Minor Fugue from Bach’s Well-Tempered Clavier, Book I,” trans. Hedi Siegel, in The Masterwork in Music, vol. 2, ed. William Drabkin (Cambridge: Cambridge University Press, 1996), pages 31–54. 13. Epstein, Beyond Orpheus, pages 127–29. 14. Schoenberg, Fundamentals of Musical Composition, page 9. David Beach, “Motive and Structure in Beethoven’s Piano Sonata Op. 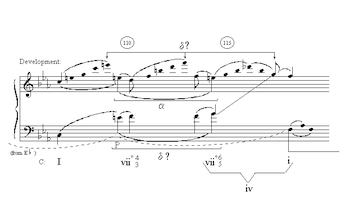 110, Part I: The First Movement,” Integral 1 (1987): 1–29; Charles Burkhart, “Schenker’s Motivic Parallelisms,” Journal of Music Theory 22 (1978): 145–75; Allen Cadwallader and William Pastille, “Schenker’s High-Level Motives,” Journal of Music Theory 36 (1992): 119–48; Roger Kamien, “Aspects of Motivic Elaboration in the Opening Movement of Haydn’s Piano Sonata in C Minor,” in Aspects of Schenkerian Theory, ed. David Beach (New Haven and London: Yale University Press, 1983), pages 77–93; John Rothgeb, “Thematic Content: A Schenkerian View,” in Aspects of Schenkerian Theory, ed. David Beach (New Haven and London: Yale University Press, 1983), pages 39–60; Carl Schachter, “Motive and Text in Four Schubert Songs,” in Aspects of Schenkerian Theory, ed. David Beach (New Haven and London: Yale University Press, 1983), pages 61–76. For instance, David Epstein’s Beyond Orpheus: Studies in Musical Structure (Cambridge, MA: MIT Press, 1979), in general treats the Grundgestalt as a unifying interval pattern, while Patricia Carpenter and Severine Neff (and I) understand it as the source of a “tonal problem” that gives rise to a process of elaboration and resolution. See the Carpenter and Neff articles cited in footnote 3. Schoenberg mentions musical idea and its components briefly in essays such as “New Music, Outmoded Music, Style and Idea,” Style and Idea, trans. Leo Black, ed. Leonard Stein (Berkeley: University of California Press, 1984), pages 113–24, and in Fundamentals of Musical Composition, 2nd ed., ed. Gerald Strang and Leonard Stein (London: Faber and Faber, 1970). He treats the concept more substantively in his posthumously-published textbook The Musical Idea and the Logic, Technique and Art of its Presentation, ed., trans., and with a commentary by Patricia Carpenter and Severine Neff (New York: Columbia University Press, 1995), though even there he does not present a complete illustration of a musical idea manifested by an individual work. More exhaustive applications of Schoenberg’s approach are provided by his student Patricia Carpenter and Carpenter’s student Severine Neff in a series of articles, of which the following are representative: Carpenter, “Grundgestalt as Tonal Function,” Music Theory Spectrum 5 (1983): 15–38; idem, “A Problem in Organic Form: Schoenberg’s Tonal Body,” Theory and Practice 13 (1988): 31–63; Neff, “Schoenberg and Goethe: Organicism and Analysis,” in Music Theory and the Exploration of the Past, ed. David Bernstein and Christopher Hatch (Chicago: University of Chicago Press, 1993), pages 409–33. John Rothgeb, review of Brahms and the Principle of Developing Variation by Walter Frisch, Music Theory Spectrum 9 (1987): 204–15; idem, “Thematic Content,” 40–42; Charles Burkhart, “Schenker’s Motivic Parallelisms,” 146–47. See footnote 2 for a full reference to Epstein’s work. Such an interpretation of Schoenberg’s concept can be traced back to Josef Rufer’s analysis of the first movement of Beethoven’s Sonata Op. 10 No. 1 in Composition with Twelve Notes Related Only to One Another, trans. Humphrey Searle (New York: Macmillan, 1954), pages 38–45. Rufer highlights the repetitions and variations of motives in the movement’s initial phrase, showing how such techniques unify the movement (and mark Beethoven as a precursor to Schoenberg the twelve-tone composer), but gives no suggestion that a process involving problem, elaboration and resolution organizes the motivic variation. Janet Schmalfeldt, “Towards a Reconciliation of Schenkerian Concepts with Traditional and Recent Theories of Form,” Music Analysis 10/3 (1991): 233–87. Example 1 also illustrates the initial occurrence of a third motive, beta, the descending fifth. Its later manifestations in the movement will be discussed at length in paragraph . My reading of measures 1–9 is modeled (though not at every point) on Schenker’s analysis in “Further Consideration of the Urlinie: I,” trans. John Rothgeb, in The Masterwork in Music, vol. 1, ed. William Drabkin (Cambridge: Cambridge University Press, 1994), pages 105–06. Schenker’s graphs at levels d) and c) in this analysis not only clearly portray what I am calling motive delta as an ascending third harmonized in tenths and my alpha as a neighbor C5-B4-C5 that is then turned into a double neighbor through the addition of the diminution D5, but they also give alpha a smaller notehead size, marking it as an inner voice in this initial presentation. Schenker in the commentary writes about a “dispute” between alpha and delta, characterizing them as ‘competitors’ for status as principal line and asserting that delta deserves preeminence as initial ascent to the primary tone. 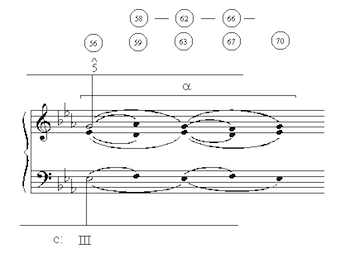 The transition is not shown in Example 2 to save space in the graphical file; the reader will want to refer to the full score for measures 32–56. Descending groups of three parallel 10ths can be heard at measures 34–36 and measures 38–40; while measures 42–46 adds tenths before and after to extend the motive to five parallel tenths, and the dominant pedal following measure 48 repeats the descending form of delta twice at measures 49–52 and 53–56, in soprano and tenor voices. Robert O. Gjerdingen, A Classic Turn of Phrase (Philadelphia: University of Pennsylvania Press, 1988), especially chapters 4 and 5. My interpretation of measures 86–90 as two alpha motives hinges on reading the six-four chord in measure 88 as a passing chord within a prolongation of the same chord from measure 86 to measure 90. This sort of interpretation has precedents in the Schenkerian literature—for example, Schenker’s own reading of measures 21–28 of J. S. Bach’s C-Minor Prelude from Book I of the Well-Tempered Clavier. Schenker maintains that a cadential six-four chord in measures 21–27 resolves to V at measure 28. The prolongation of the six-four chord is accomplished mainly through a neighbor viio7/V. In turn, chromatically-altered chord skips from F to A and back to F within this viio7/V are filled in by passing Gs, creating passing six-four chords that are ultimately part of the prolongation of the same chord. See Figure 1 (page 48) and the associated commentary (especially pages 50–51) in Heinrich Schenker, “The Organic Nature of Fugue as Demonstrated in the C Minor Fugue from Bach’s Well-Tempered Clavier, Book I,” trans. Hedi Siegel, in The Masterwork in Music, vol. 2, ed. William Drabkin (Cambridge: Cambridge University Press, 1996), pages 31–54. Epstein, Beyond Orpheus, pages 127–29. Schoenberg, Fundamentals of Musical Composition, page 9.